“It’s like real-life Tetris,” Josh said, laughing. “Every time we load stuff, it’s hilarious,” Sarah said. “We have to sit around the drums. And the microphones are, like, here,” she said holding her hands on either side of her head and gesturing forward and back. Josh pivoted on the restaurant bench and leaned back. “One time Andy had to sit like this,” he said, lifting his legs to place his feet on an imaginary drum. “And there was always something wrong with that car,” Sarah said, shaking her head, somehow frowning and giggling at the same time. “The Jeep Liberty! That was fun!” Josh said, meaning it. We were having lunch at White Duck Taco Shop in Asheville, talking about Josh Linhart and Sarah McCoy’s new music venture. These two have been performing together since 2011 when they were college sophomores majoring in music at Mars Hill University. Now, five years later, they are two of the four musicians in the newly formed group, WHYM. Sarah is the vocalist and plays keyboard and guitar; Josh plays percussion; Andy Little, also a MHU grad, plays bass; and Nathan Culberson, a graduate of University of North Carolina in Asheville, plays electric guitar. Silence. We sat there, thinking, not talking, about those four little letters. Sarah was the one to respond. If WHYM is anything, it’s authentic. 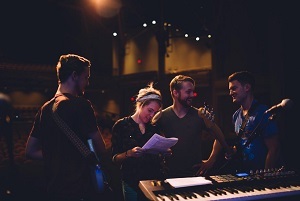 These musicians have been raised in the church; all four came to know Christ early in life. (Three of them are actually pastors’ kids!) They have lived their faith, wrestled with it, questioned it, and have kept believing. Their music draws listeners into a safe space where followers of Christ don’t have all the answers, where mystery is expected and therefore is not nearly so scary. As a youth minister, a parent to teens, and a friend to many college students, I can attest that this is the kind of safe place our students are seeking: a place where Jesus is Lord, the Holy Spirit moves in the most mysterious of ways, and humanity is beloved by God, even when they are uncertain.